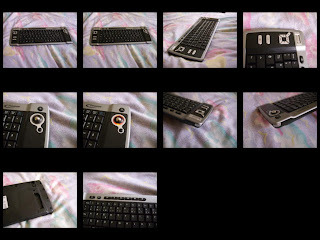 to day i want talk you about a very nice Keyboard for media center. This keyboard enable you to control Mouse, with a nice ball. This keyboard is small, and you can found it in QWERTY and AZERTY. It's a wireless, (not infra-red), using a 2.4Ghz frequency, using an Usb Key. Mouse can be enable when you press a button. Two buttons on Left top and Right top, permit you to do Left click and right click. Now, connect it on Linux ! I Use Debian Lenny (Testing), with a Home Kernel (2.6.21). I Just connect Usb Key on my computer, press the button on the dongle to interconnect Usb Key and keyboard, and press the button on back of keyboard. Yeah, i'm very surprise, but evrything works, without more configuration. Some key can increase, decrease and mute volume. Some other permit you to surf the web. From left top, to right bottom.